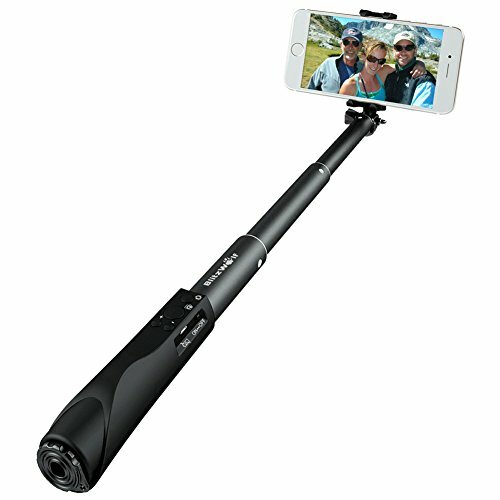 Entire Photo Functions -- Latest selfie stick with 4 button (shutter, camera switching, zoom + & -), built-in bluetooth module and rechargeable battery . Aviation Lightweight & Strong -- Aluminium alloy stick with inner plastic padding, ergonomic handy design for grip. Length adjustable from 22.35cm to 90.17cm, twist to lock and unlock the length. Removable Phone Holder -- Phone clamp suits phone size of 3.5\'\'-6\'\', suits all existing common phone models. You can also remove the phone holder to connect with SJ cameras and Gopro. And it snaps with 270 degree vision to help you capture perfect shots from various angles. Powerful 200mAh Lithium Battery -- Internal 200mAh rechargeable lithium battery full charge within 2 hours, power the selfie stick keep working for 20 hours, and last for up to 72 hours in standby mode. Enjoy selfie now! High Compatibility -- It is suitable for iPhone se/7/7 plus/6s plus/6s/6/5s/5c/5, Samsung Galaxy s5/s6/s6 edge, Note4/5, lg g2/3, HTC, Sony, Moto and 3.5\'\'-6\'\' smartphone.